Vigorous large shrub. Fern-like pinnate foliage with small leaflets, becoming bronze in autumn. 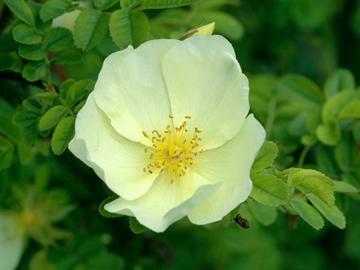 Single, slightly scented, pale cream yellow flowers followed by orange-red hips. Most reasonable, moist, well drained soils in an open sunny position. Chance hybrid that occurred in Cambridge Botanic Garden, about 1931. Possibly a cross between R. 'Hugonis' and R. sericea.